This is less of a pin of the week than it is a call to arms. I found this gorgeous bouquet on Pinterest, so of course I pinned it. I absolutely want them but, trouble is: I have no idea what kind of flowers they are and if they are naturally purple on the inside or if they are dyed that way. I think they are calla lilies and I don't think they are naturally purple, but I'm not 100% certain. BRIDAL BABBLE: Do you know what these flowers are and if they are naturally purple on the inside? 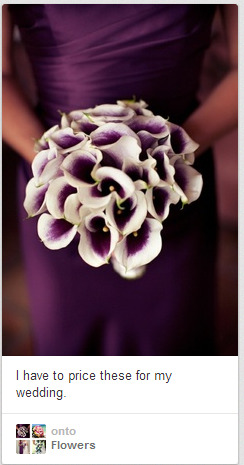 UPDATE: Turns out, they are Picasso calla lilies and I did in fact have them in my bouquet. You can see photos of my bouquet here.